We have just returned from a lovely 10 days away on 2 separate mini breaks with Mark's mum and dad. 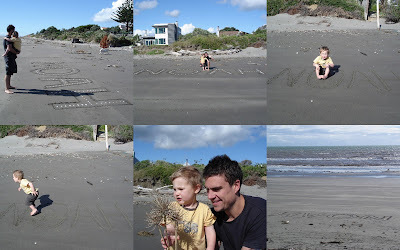 Last Saturday we went up to Allie's beach house, the scene of our special day five years ago. After Wellington was belted with some terrible weather on the Friday, the remnants of Cyclone Innis passing over us, we weren't holding out much hope for a nice day. However, we were pleasantly surprised to find that out at the beach a gorgeous, sunny day awaited us....the day we should have had five years ago. We enjoyed a lovely relaxing afternoon on the beach, reminiscing and revelling in our memories. We were incredibly fortunate to have amazing weather for the whole time we were at the beach, especially when the weather in Wellington 40 minutes down the road was nowhere near as good. Sunday we went to a quaint cafe in Waikanae called Relish, which is housed in a beautiful old villa. They had the best cheese scones which we all partook in! 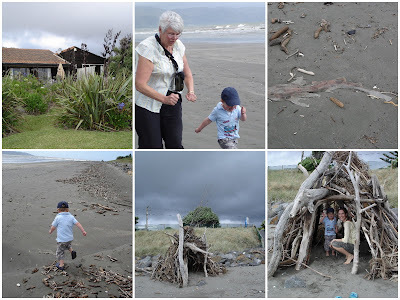 Then we headed down to Waikanae Beach for a look around and a play in the park. In the afternoon we enjoyed an hour or so down at the Raumati Gardens riding on the miniature trains that come out to play every Sunday afternoon. 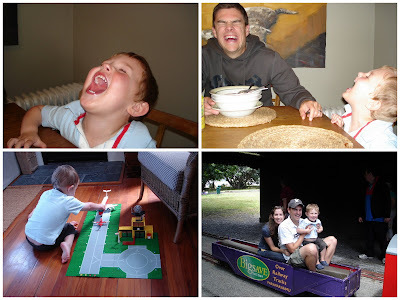 Monday we took a jaunt up to Otaki, stopping in at the lovely Red House Cafe for coffee on the way up, and lunch on the way back, enjoying a bit of outlet shopping at Icebreaker, Bendon and Pumpkin Patch in the meantime. 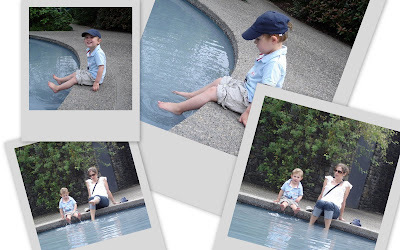 Monday afternoon we caught up with my friend Linda (her husband Andrew just completed our landscaping) and her wee boy Oliver for afternoon tea. It had been a fair few months since we last caught up so it was lovely to catch up on all the news. 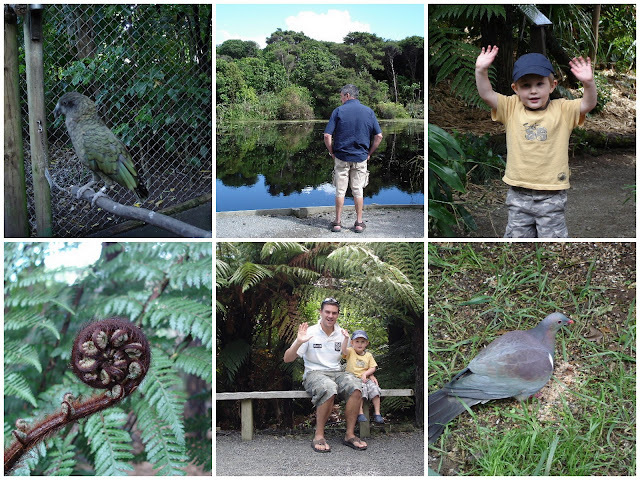 Tuesday morning we took a trip out to the picturesque and serene Nga Manu Nature Reserve. 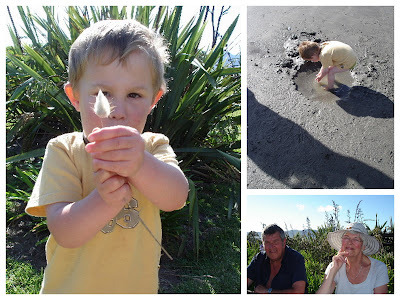 This is a beautiful spot out the back of Waikanae where you can easily wile away several hours amongst native NZ wildlife, kereru, kaka, kea and even kiwi (it was the first time Mark's M&D had ever seen a kiwi so they were especially thrilled). We enjoyed a sumptuous lunch at The Front Room before heading home for another chilled afternoon on the beach. Wednesday we cleaned and tidied up before enjoying brunch at The Busy Bee Cafe. Then there was time for one last swim (in fact Mark and his dad braved the waters every day we were there), then we headed home to Wellington. Mark and I also enjoyed the opportunity to run, walk and bike on the beach each day, making a change from our usual circuits around the hills of Wellington. Thursday, I worked most of the day whilst the others prepared for our flight up to Hamilton. Then we were up, up and away late afternoon, arriving in Hamilton in time for dinner with M&D. 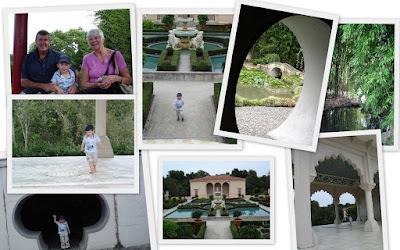 Friday, we enjoyed another jaunt to the Hamilton Gardens (a first time for Mark's M&D), and a lazy afternoon around the house. 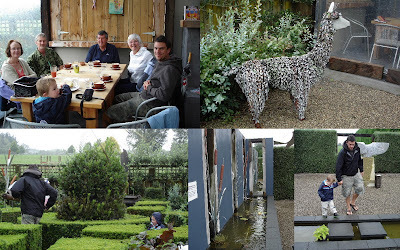 Saturday it poured all day, but we made the best of it by getting out amongst it, enjoying a lovely brunch together at The Lilypad Cafe, another quaint spot complete with its own lily pond, and garden filled with outdoor art. We got all our old books out of the garage (including our Little Golden Book collection) and Noah was most enthralled and didn't know quite where to start. Sunday, we took a brief jaunt to my brother Sam's bike shop as it was our only chance to see him over the weekend, busy boy that he is. Mark, Noah and I were due to fly back to Wellington at 12.55pm, or so we thought. So we hopped in the rental car, going via the petrol station to make sure we returned the car full up. And that is where our happy week away ended and our nightmare journey home began. We arrived at the airport at 12.30pm, quite pleased that our detour to get petrol hadn't made us too late....boy were we in for a shock. When we got to the check-in desk, the guy behind the desk said...'that's your plane just taking off on the runway'.....and our hearts just sank. We are still asking ourselves how we could have been so foolish as to not double check and triple check the flight time, convinced we were that it was 12.55pm, when in fact it was 12.25pm. If only we had just taken the car straight back without filling up, if only we had checked the flight time again at some point over the weekend, anyway the one great thing was that we stuck together through the whole ordeal. There were no recriminations, no blame laid, just a matter of pulling together to figure out how best to get ourselves out of such a bad pickle. As it turned out, our only real option was to book 3 more seats on the 2.50pm for the *choke choke* sum of $734. And so we are now home again, a few hours later and poorer than planned. Of all the dozens, if not hundreds, of flights we have taken between us in our lives singly and together as a couple and family, we have never even come close to missing a flight before. But I guess there is a first time for everything. On the positive side, we are firm believers in things happening for a reason, and God being in every situation. We don't know why and we probably never will know why, but for one reason or another we were obviously not meant to be on that flight, so we have to believe that, and simply move on. Onwards and upwards as they say!